I’m going to get a bit personal here so bear with me. 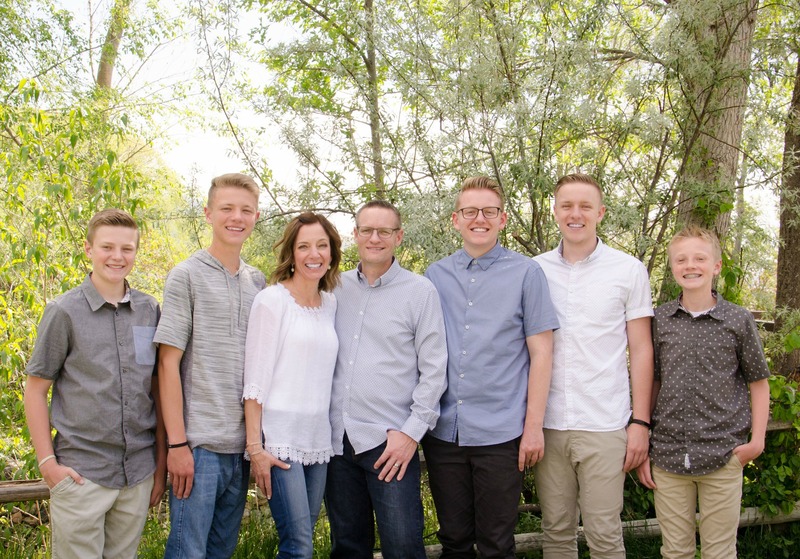 . . .Life with 5 boys is definitely an adventure. I’m surrounded by testosterone. Some days around here are rambunctious and other days are calm and quiet. Some days I walk into a room and get a whiff of the stinky-sweaty-boy-smell. Very rarely can we make it through a meal without some kind of bodily-function noise coming out of one of them. I’d like to think I’ve done a pretty good job of reminding my boys to try and have good aim when going to the bathroom, but they’re boys and that doesn’t always happen, so thank goodness for Clorox wipes. The other day I was cleaning one of our bathrooms and saw that one of the boys hadn’t done so well on the “aiming part” and hadn’t wiped up after themselves. Parker was in the room next to me and I yelled out something about one of them having terrible aim to which Parker replied, “It wasn’t me Mom, my aim is impeccable!” Oh, the things that come out of his mouth. Yep, this is my life and I wouldn’t trade it for anything. I love my boys. I also love treats, in case you couldn’t figure that one out. 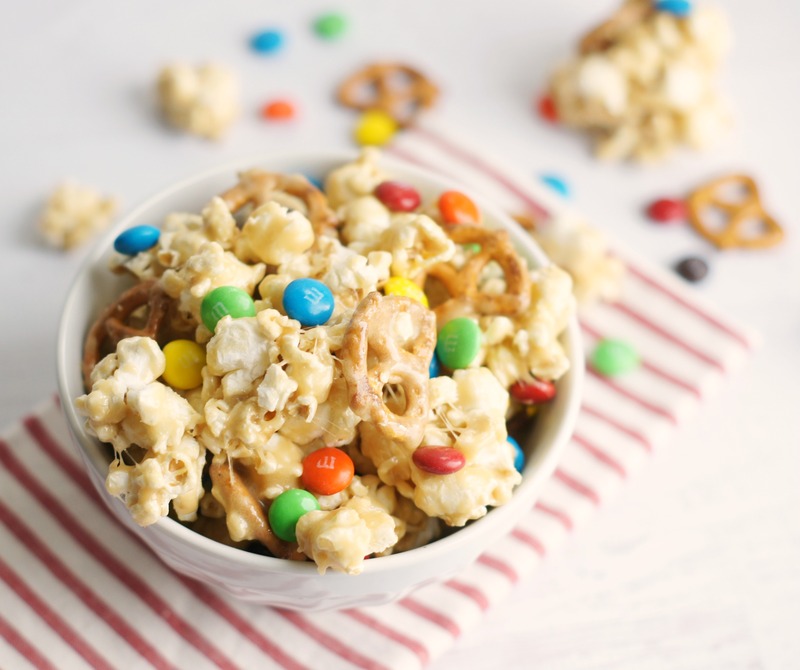 When I saw this recipe for Sweet & Salty Marshmallow Popcorn, I think I waited about 43 seconds before I was making it. The whole sweet & salty thing just gets me. I’m going to warn you this stuff is dangerous. It’s highly addictive and just crazy, crazy good and so simple to make. We couldn’t stop eating it. Life with 5 boys is good, but life with 5 boys and Sweet & Salty Marshmallow Popcorn is even better :)! Sweet, salty & gooey, this popcorn will win you over with the very first bite. So simple to make and perfect for any occasion. 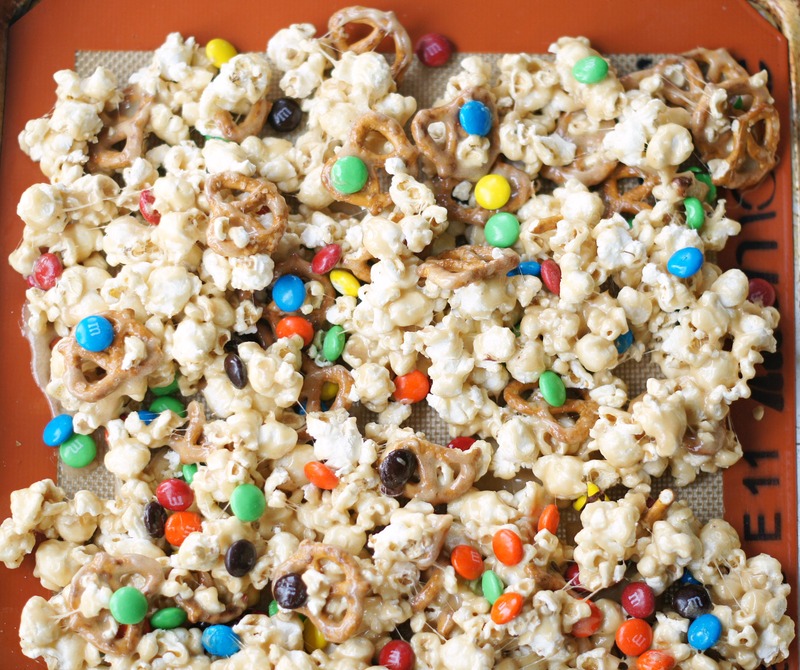 Place the popcorn and pretzels on a large baking sheet that has been lined with a Silpat baking mat. Set aside. In a medium saucepan, melt the butter over medium heat. Add the brown sugar and corn syrup cook and stir until combined. Add the marshmallows and stir until completely melted. Remove from heat and add the vanilla and salt, stir well. Evenly pour the marshmallow caramel mixture over the popcorn and pretzels. Carefully stir toss until the popcorn and pretzels are well coated. It will be sticky! Gently toss in the M&M's. Store in an airtight container for up to one week. The popcorn will stay sticky and soft! I have to agree with you! We couldn’t stop eating it. Thanks for the comment.